"The National Symposium on Medical and Health Care Education Reform, the Mayo Clinic Department of Education, and the Mayo Clinic Health Policy Center (HPC) are convening on April 27-28, 2009, nationally-known leaders in medical and health care education to develop recommendations that will transform education to best facilitate health care reform." Doctors have no specific drugs to treat dengue fever, a viral illness spread by mosquitoes that sickens 50 million to 100 million people and causes 20,000 deaths worldwide each year. Researchers have identified the cellular components in mosquitoes and in humans that dengue virus uses to multiply inside these hosts after infecting them. Scientists are hopeful that these findings could lead to the development of anti-dengue drugs. The National Institute of Allergy and Infectious Diseases (NIAID), part of the National Institutes of Health, funded the research, which was led by Mariano Garcia-Blanco MD PhD, of Duke University Medical Center. The research appears in the current issue of the journal Nature. 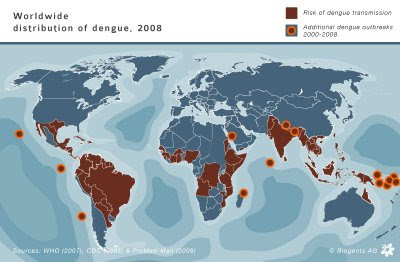 Click for further information on NIAID research efforts on dengue fever. What an inspiring, fresh face the US government's Healthfinder website has now! So inviting and clean looking, it makes you want to be healthy! Also included are some very straight forward tutorials giving you a tour of the features and uses of the site, and helping you navigate and search for the health information you need. Share this site with all your patients, friends, and family. "This updated practice exam has been refined to provide a more realistic representation of the USMLE Step 1 exam, with questions that are more relevant and appropriate. Students will find that over 25% of the questions are new. Students will also find that, in keeping with updated USMLE guidelines, each question block now consists of 48 test items, for a total of 336 questions. Topics covered include General Principles, Principles of Therapeutics, Abnormal Processes, Normal Development and Structure, Normal Processes, Cardiovascular System, Renal/Urinary System, the Endocrine System, the Gastrointestinal System, the Musculoskeletal System, Central and Peripheral Nervous System, the Reproductive System, and much more!" Study the anatomy of the human body with this fun, interactive, award-winning website which includes animations, graphics, tutorials and descriptive links. Brought to you by MyHealthScore.com, this is an ideal reference site for students or those who just want to know more about the medical descriptions used by doctors and nurses.